Italian fencing master Valentini Vezzali is charging towards a rare Olympic milestone at Beijing in 2008 as she bids to become only the fourth woman to win three consecutive individual gold medals. The veteran foil specialist is still at the top of her art as shown by her run to the 2007 world title but she can now emulate Soviet gymnast Larysa Latynina (floor), Australian swimmer Dawn Fraser (100m freestyle) and Hungarian 200m backstroker Krisztina Egerszegi in the Olympic history books. The last time she lost an Olympic match was in the 1996 final but the competition promises to be intense in China and her narrow defeat in the 2006 world final against compatriot Margherita Granbassi laid down warning signals that she might not have it all her own way in the Chinese capital. In Saint Petersburg, a year later, the two women again faced off in the world final but this time Vezzali beat Grandbassi 15-8 for her fifth foil title in 2007, the same year in which she claimed silver at the European championships. Then again the odds will be short on her successfully achieving her next goal after a glittering career that has also seen her crowned Olympic team champion twice (1996, 2000) and world individual champion four times to go with three further appearances in the world final. The significant breakthrough Vezzali richly deserved came at the Sydney Games in 2000 where she swept to the individual gold medal and four years later in Athens, she beat compatriot and teammate Giovanna Trillini in her third straight final. A brilliant team fencer, the Italians are a match for anyone and she has been part of two Olympic winning sides and been to six world finals, winning four. Her strengths lie in her intuition and inspiration and she is most at ease when forced to defend - giving her opportunities to launch merciless counter-attacks. Her crushing victory over Germany's Rita Konig in the 2000 Olympic final was followed four years later in Athens by her second gold when she ousted her great rival and compatriot Giovanna Trillini by a scoreline of 15-11. 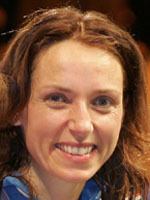 A decision by the International Fencing Federation in 2002 to remove the women's individual foil event from the Olympic programme raised her hackles and she led a successful rearguard action with fellow fencer Sabine Bau of Germany to rescue the event. She will be 34 when the Olympics dominate the world's sporting stage in 2008 and she warmed up for another gold medal quest by winning her 60th World Cup event in June 2008 as she chases what would be yet another fantastic achievement in an already legendary career. On blip in her build-up was in July 2008 when she was beaten in the 2008 European championship quarter-finals.